AFL-CIO Community Services is preparing to distribute shoes for the Soles for Christ shoe program. The program provides a new pair of shoes for children to start the school year. The goal of the program is to boost the child’s self-esteem and enthusiasm for the coming school year. It also provides parents with some monetary relief in covering the initial expenses associated with the new school year. Eligibility is based on where the child resides. Children in preschool (age 4) through 12th grade living in Buchanan and Andrew counties in Missouri and Doniphan County in Kansas are eligible to receive a free pair of tennis shoes. This includes public, parochial and home-schooled children. 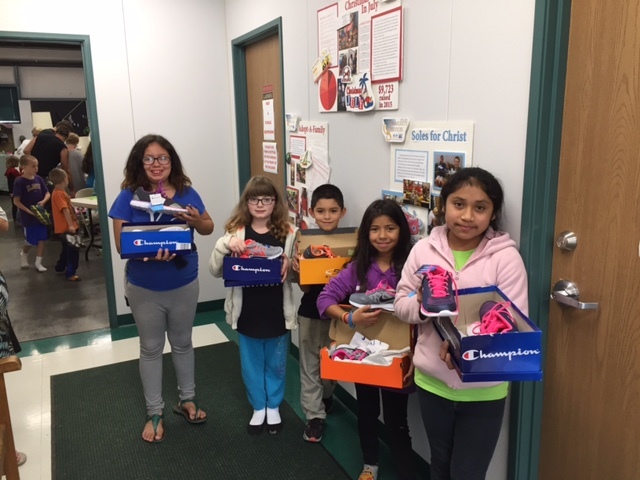 The program began in August of 2003 when a member of Our Lady of Guadalupe Catholic Church visited an out-of-town parish where the Soles for Christ Shoe program was already implemented. The member was a schoolteacher and recognized the need within our own community and saw an opportunity for action. Their church began collecting shoes, then contacted our agency and asked if we would be the distribution center for them. The 2018 shoe distribution will be Monday, August 6, from 8 am to 4 pm and Tuesday, August 7, 8 am to 6 pm. There is no pre-registration needed. Parents or guardians need to bring children with them to the distribution. They also need to furnish one form of identification for each child (school ID, report card, birth certificate, any document that proves the child’s date of birth) and proof of residency (utility bill, rent/mortgage receipt). Preschoolers must provide proof of enrollment in a preschool. For other questions, please contact AFL-CIO Community Services Agency, 364-1131.